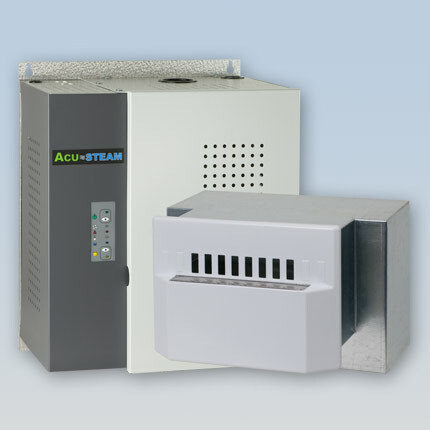 Thermolec’s Acu-Steam humidifier line has a new companion. To be able to provide the power of steam for houses and condos without duct work, we developed the Split Steam which has a steam generator and a steam distribution module which contains a quiet fan to gently distribute the sanitized steam into your environment. Split-Steam Humidifiers are the evolution of Acu-Steam humidifiers by Thermolec, an industry leader in comfort heating products. Its compact size and standard features make it the easiest to install, operate and maintain. Specifically designed for locations without ductwork, the steam distribution module is wall mounted. The quiet electric fan is mounted in the wall leaving only the low profile faceplate exposed on the finished wall. Mounting of the steam generator section is done in a utility room/closet with access to a cold water line, electricity and a proper drain. With a quick release stainless steel tank that has no electrical or plumbing connections to simplify cleaning, there is no need to buy costly replacement tanks or liners. The tank is equipped with a siphon drain which eliminates the chance of blocked solenoid valves or pumps and water is drained at safe temperature below 60 ºC (140 ºF). Extremely efficient and Environmentally friendly.